Chardonnay Pinot Noir by Philip Shaw of Orange. . . .
Shaw was focused on a property which would yield lovely elegant wines with good structure, bright fruit, terrific balance and length. A sophisticated style of wine which could be an Australian benchmark. In close proximity to the region’s highest peak, extinct volcano Mt. Canobolas, Koomooloo rises to an altitude of 900 metres with red loam soils over limestone. But the dream started long before the acquisition of Koomooloo. Shaw spent years investigating and exploring many regions within Australia until by accident he noticed the undulating roll of the countryside when flying over the Orange region. After a few days of intense research into this highland area he returned the next week to find the region had a near perfect balance of elevation and sunshine. Koomooloo is 47 hectares of a unique hand kept vineyard, planted by Shaw and his family between 1988 and 1989, managed by a routine of hand pruning, shoot thinning, leaf plucking, crop thinning and hand picking happening in multiples if needed. Koomooloo took twenty years to find and another twenty years to grow. Fewer than 1% of Australian vineyards rise above 600 metres above sea level, Koomooloo is one of the highest viticultural sites on the continent. Annual rainfall averages 850mm, although it’s not unusual to see snowfalls during winter and into spring, the ripening months of February to April are traditionally the driest. Higher altitudes provide cooler conditions throughout the growing season. The fruit from Koomooloo has clearly defined varietal character that displays elegance, power and length. This immaculately tended vineyard has already produced the Prix D'Excellence Chardonnay at the 1998 VinExpo in Bordeaux and Best Red Wine at the 2002 National Wine Show in Canberra. The Orange region generally and Koomooloo in particular is perfect for the styles of wine Shaw is keen to make. Understanding the uniqueness of the region has been an unravelling journey. To respect and work a vineyard like Koomooloo to its full potential is sometimes daunting, however the future is too exciting to sleep through. The Orange region has so much to offer and, finally, people are now starting to notice this quiet achiever. Deep aged limestone is at the base of Koomooloo with volcanic rock soil forming the sub-section. Topsoils are predominantly 150mm of wind blown fine red loess from Central Australia, some of the oldest on the planet. Shaw has been making wine in Australia for more than four decades and he approaches each aspect of winemaking with a healthy mix of innovation and unrelenting quality standards. Shaw's wines are made only from grapes grown at Koomooloo. He has waited a long time to make sure the vineyard has enough maturity before attempting to make wine from it. Great wines should have silk, a softness, a texture, in chardonnay and pinot particularly but to some degree it should be in all wines. The tannins should be elegant and soft. It's about finishing a wine off, not refining it, but getting it right. It's in the making – a marriage between the vineyard and the winemaking. The wines of Burgundy illustrate the point, where there may be 10 to 20 different vignerons in the same vineyard owning three to four rows each and the quality of the wines and differences in styles is just enormous – it’s not only the vineyard, it's the making, the union. 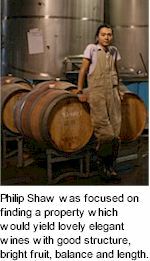 Philip Shaw was twice International Wine and Spirit Competition's Winemaker of the Year. Following a career as chief at Rosemount and Southcorp, Shaw laboured to determine the most favourable terroir in Australia, capable of making classic wines with elegance, depth and bright fruit character. Shaw's search for the ideal Australian region came to rest in 1988 when he accidentally caught sight of the undulating countryside whilst flying over Orange in New South Wales.